Carroll Healthcare 80" by 35". Pendant operated. Pendant lock out at foot of bed. We have used this bed in our home for a little over 3 years. 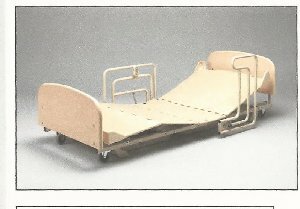 It has been a back saver for us and has allowed us to move our patient in and out of bed with the least amount of pain. It will hold 500lbs and is mint condition. Matteress is included along with assist rails. Does not include the foot board or headboard.